"Dialogues in Thread: the Quechua Concepts of Ayni, Ukhu, Tinku, Q’iwa, and Ushay" by Rebecca R. Stone, Ph.D. Figure 1. 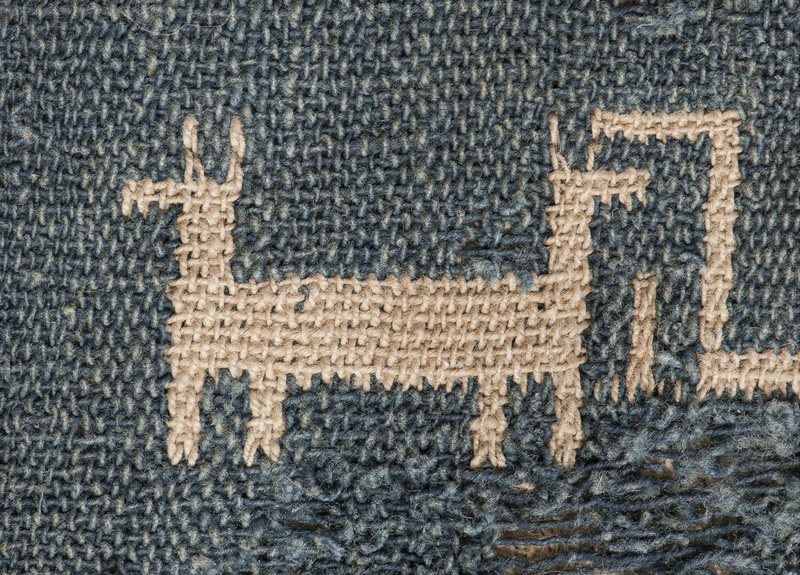 A detail of the Chancay doublecloth shows llamas on leads attached to their herders; doublecloth and herding represent different aspects of the concept of ayni or reciprocity. Michael C. Carlos Museum, 2002.1.37A/K. Photo by Michael McKelvey, 2017. 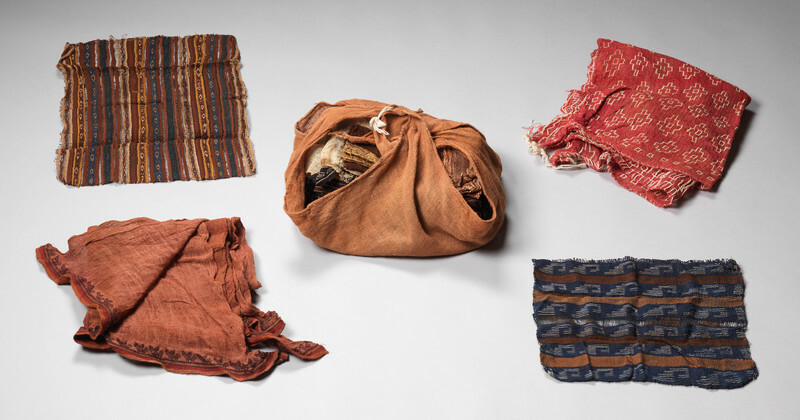 The concepts related to the highest-status cloth of the Inkas, their qumpi (see The Best of the Best), are undergirded by other important Quechua concepts: ayni, tinku, ukhu, and q’iwa. Indeed, the areas of the ancient Perú gallery in the Threads of Time exhibition are organized around these concepts. 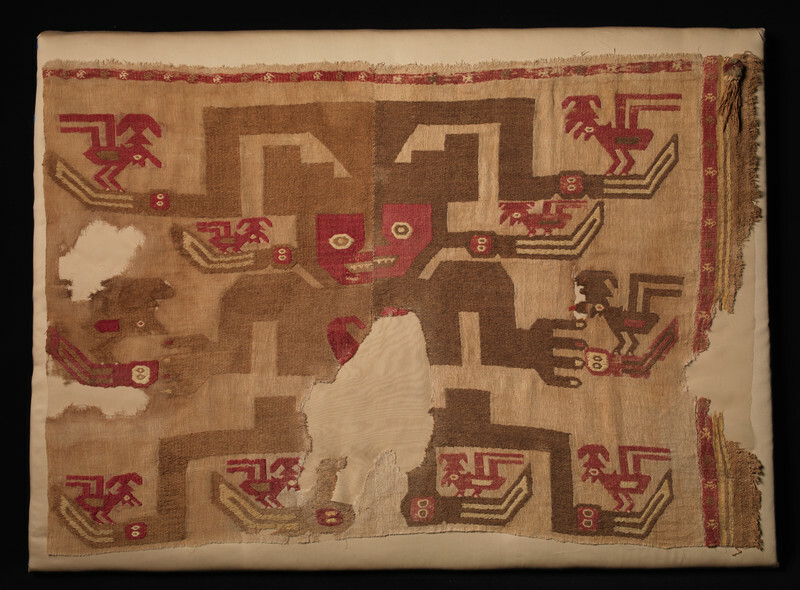 A fifth concept, ushay or supreme balance, is discussed here as a central Quechua value found throughout Andean life and in textiles in particular; however, it is so pervasive and broad an ideal that no one group of pieces could represent it. Figure 2. 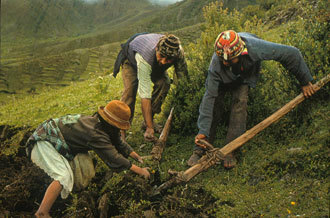 Modern Andean farmers work together to dig into the soil with long foot plows and break up the clods of dirt, a social statement of the idea of ayni. Photo by Ben Orlove. These five ideas illustrate how the general Andean worldview is complex, layered, and based on different understandings than that of most Westerners. For instance, whereas we say the future is ahead because it is a place not yet reached, Quechua speakers say it is behind because it is not yet seeable (Classen 1993, 13). It is quite literally a matter of perspective. In another key cultural-visual distinction, the Inkas and their descendants see dark areas in the night sky as images, not sets of stars as constellations (Urton 1981, 169). This is partly due to the actual appearance of the Southern Hemisphere, which appears as a near-solid carpet of stars interspersed with gaps. However, it also signals a different perception of reality, one that is dialectical. Andeans recognize “negative” and “positive” space as complementary partners. In fact, each of the concepts discussed here is relational, that is they are about two or more things in relation to each other, ideas in dialogue played out in thread. Ayni signals a dual, reciprocal relationship, one with interlocked and interdependent parts, although the two are not exactly the same. Similar halves form a dynamic balance when in the proper alternating and complementing mode. Tinku is a convergence, especially where two come together into one, though it may be a somewhat conflictual encounter or a turbulent confluence. Ukhu is the dialectic of the unseen and the revealed, the inner and the past in relation to the outer and the present. Finally, q’iwa is the dialogue between the regularly predictable and the intentionally digressive; it is the surprise, the purposeful “off” note. All of these concepts relate deeply to the medium of textiles, but also reflect the Andean experience of their environment and their social structures, which evolved to ensure survival in such difficult climes (as discussed in The Best of the Best). Figure 3. This slit tapestry design completely interlocks some pelican motifs and almost interlocks others in a complex expression of ayni. Michael C. Carlos Museum, 2002.1.18. Photo by Michael McKelvey. Ayni represents duality as the basic assumption in any phenomena, from social obligations, such as planting (fig. 2), to gender roles, to weaving. In Quechua, there exists no word for “finger,” a singular entity, but there is one for the spaces between two fingers (Bruce Mannheim, personal communication to Rebecca Stone, 2015). In the Andes, a single thing is an aberration (see Q’iwa, see below), while the interrelated pair is the norm and defines completeness. An ideal pair is called warmiqhari, “woman-man,” the gendered couple whose skills dovetail, allowing for both to flourish. At a base level, the underlying importance of ayni is due to the environmental challenges of the Andean region. The juxtaposition of the low desert coast, the formidable mountains, and the dense rainforest creates a situation in which it is almost impossible to survive in a single eco-niche, but with cooperation between people inhabiting various zones, all can prosper. Animals and plants also thrive at different altitudes so that cooperation, trade, and movement are also necessary (Lumbreras 1974, 42-45). By practicing ayni, various groups helping others, all these problems can be solved. One area needs its canals cleaned, another has had a flood, and a third has plenty of corn but no beans. Hence the two entities in the equation need not be absolutely equal. Yet, despite dissimilarities, ayni pairings maintain visible, flexible balance between two complementary parts. Ayni is the concept most obviously applicable to weaving, in that it represents reciprocal actions, sets of dualities that complement and ultimately complete each other. It governs combining complementary materials from different eco-zones (cotton and animal), spinning and plying thread (twisting it one direction then the other [fig. 4]), moving two sets of threads (wefts across warps [fig. 3]), many specific weaving techniques (e.g. doublecloth [fig. 1] and complementary warp [fig. 8]), motifs and their composition (interlocking patterns), subject matter (herders and llamas [figs. 1, 27a-d]) and assembling compositions from dual parts [fig. 11] or even pretending to do so [fig. 12]. Figure 4. This modern skein of dyed alpaca thread illustrates how threads are first spun (here in the / or Z direction), then plied (here in the \ or S direction). Photo by Michael McKelvey, 2017. 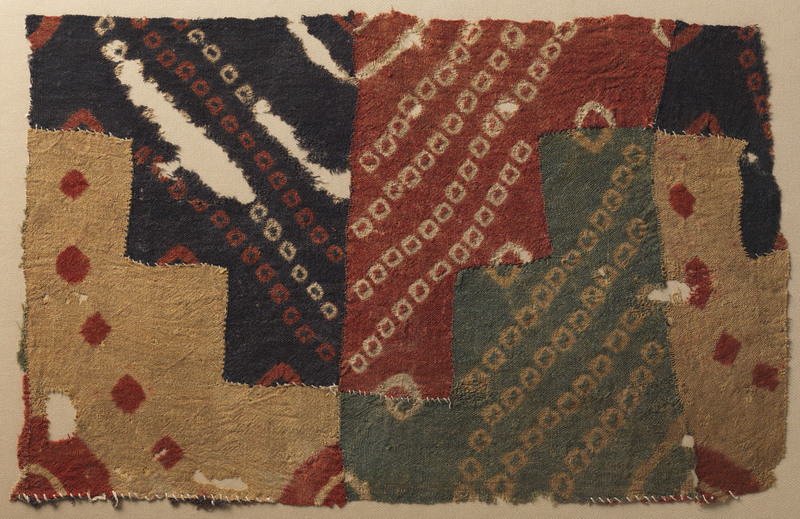 Two of the finest examples of ayni in textile form in the Carlos collection are the llama and herder’s doublecloth (figs. 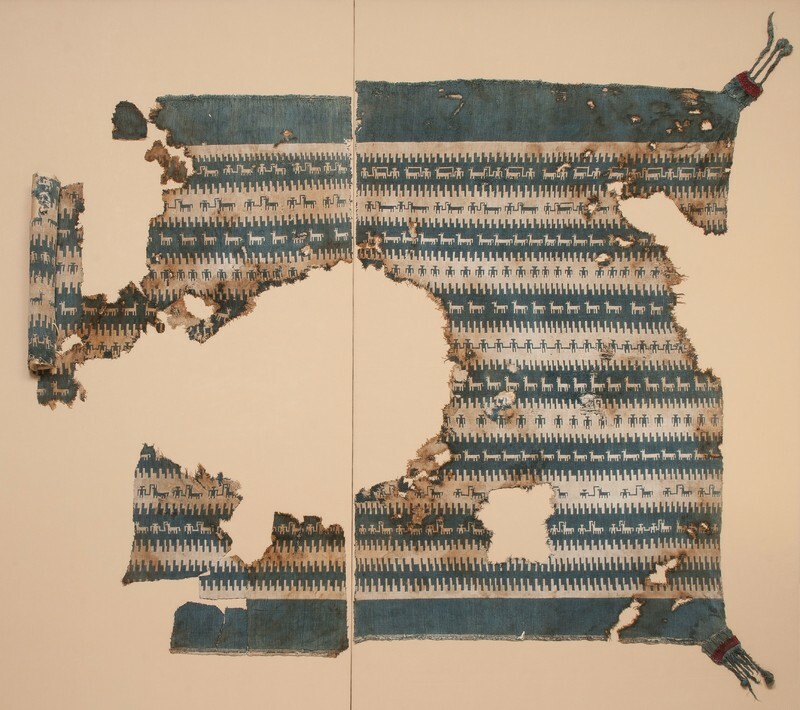 1, 27a-d) and the interlocked birds slit tapestry (fig. 3). Contrasting colors of dyes juxtapose blue-and-white and brown-and-white, each employing high color contrast to accentuate the motifs. A related pair of words in Quechua are samí, all that is light and bright, and hucha, all that is dark and heavy (Quilter 2014, 48). These bi-chrome compositions seem to pair those nested concepts within ayni, because the components are so different from one another (lack of color/color, light/dark, warm/cool). Yet the designs achieve balance between the two colors, as in the ideal ayni situation in which distinctive parts find their place in a whole as equivalents but not as equals. Spinning thread involves twisting fluffy fibers around and around to make a single thread (fig. 4). Since a “single” thread is not very strong and tends to kink up, spinners twist two singles together, called plying, and the thread is made stronger and straighter by plying the two in the opposite direction of their individual twists (though remarkably, singles are used exclusively in fig. 12). However, plying is actually accomplished by taking a length of the single thread, holding it folded in half, and allowing it to twist itself the other direction to ply itself, which it does quite willingly (as per the physics of equal and opposite reaction). Plying itself therefore constitutes a dramatically experienced ayni, in which singleness wants to be paired; indeed, thread pairs itself. This action of self-plying readily suggests to spinners that thread is alive, it moves, it has agency; indeed, ancient Andeans almost never cut thread, seemingly understanding it as a living entity (see The Best of the Best). Whether the fur of a camelid or sheep, or the popped-open part of a cotton plant, it is considered to maintain the life force of its source. When dyed, to the Andean way of thought, it further assumes the life force of other animals (cochineal) and plants (indigo and myriad others). Figure 5. 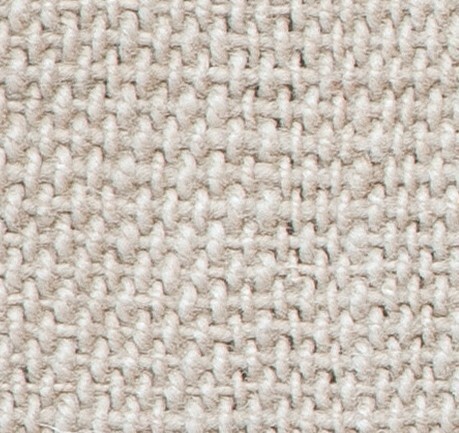 An extreme closeup of the plain weave in figures 1 and 27a-e, showing the simple over-and-under alternation of threads in both directions that is basic to making cloth. Michael C. Carlos Museum, 2002.1.37A/K. Photo by Michael McKelvey, 2017. Importantly, in Quechua the verb camay, loosely means to create but more accurately connotes the constant exchange of energy and making the unmanifest manifest. The concept of camay entails the dynamic of an energy source, the camac, infusing life into the recipient, the camasca (Salomon 1991, 16). Energy is specific: the camac of llamas is distinct from the camac of cotton. Likewise the camascas have their own unique form, either as a long-legged animal or a hearty plant. Once more, all important concepts are dynamic interrelations and most involve energy exchange or transformation at some level (Howard-Malverde 1997, 76). Spinning leads directly to plying, first the spinner as the camac, imparting movement to the fibers, and the single thread as the camasca, receiving that uni-directional motion. Then, during plying, that thread takes the uneven physical energy and twists itself in the other direction, forming a straight, strong, and complementary whole. While we might see the thread plying itself as evidence of Newton’s Third Law, to an Andean way of thinking, thread is a perfect, living expression of ayni. Figure 6. The highland Inka, like the Wari before them (fig. 22), practiced interlocking as the preferred join in tapestry. Michael C. Carlos Museum, 2002.1.128. Photo by Bruce M. White, 2014. As one might expect in such a textile-oriented tradition, there is actually a specific word for twisting two together: k’eswa (Franquemont 1986, 332). K’eswa signifies the spiraling of two things and so encapsulates a particular kind of ayni, one based on what we would call rotational symmetry. 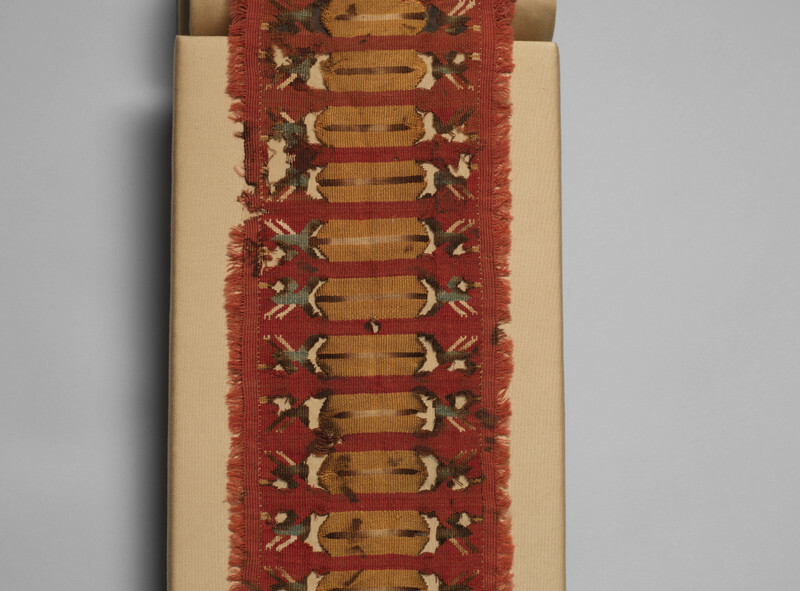 In previous Andean studies this was known as the “twisted strand” and is not only the basic unit of weaving but becomes celebrated as the basis of many designs as well (Frame 1986, 50). In other words, large-scale twisted strands become the patterns on textiles made from the small twisted threads themselves. Thus, the underlying technical ayni becomes the visible design ayni. Perhaps the most obvious ayni is expressed during the process of weaving itself (fig. 5). The warp element goes one way, while the weft goes opposite, and together they create cloth. One thread goes over, another under, and a solid plane results. They are both twisted fiber threads, but otherwise usually take on complementary roles, materials, and colors or lack thereof. For instance, often in the Andes the warps are undyed cotton, its strength suited to the structural role, and the wefts dyed camelid fiber which bend more easily and hold dyes better (e.g., figs. 6, 7). Figures 7a. 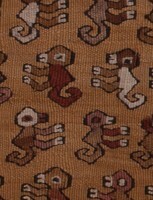 These charming one-inch-tall monkeys were made in the typical Chancay slit tapestry technique. Michael C. Carlos Museum, 1991.2.162. Photo by Michael McKelvey. Figure 7b. Michael C. Carlos Museum, 1991.2.162. Photo by Michael McKelvey. Tapestry is a variant of over-under plain-weave, except that the wefts are packed down so as to completely cover the warps. Colorful wefts extend part of the way across the warp, changing with one another to create intricate patterns. There are various ways that adjacent, different-colored wefts interlock (fig. 6; Emery 1966, 79) or dovetail with each other, or do not interact at all and therefore create slits between color areas (fig. 7; ibid.). Slit tapestry is more characteristic of coastal cultures, such as the Chancay, while interlocked is the preferred join type for the highland Wari and Inka Empires. Other more complex techniques even more deeply reflect the concept of reciprocity inherent in the fiber arts. Ayni is deeply expressed in techniques that are two-faced, meaning both the outer surface and the inner are similarly finished and mirror one another in some way. Usually shape patterns are the same on both faces but colors reverse, because threads exchange places with each other; in other words, when white is on the obverse, blue is on the reverse, and vice versa. In figures 1 and 27a-d a blue figure on a white ground is visibl;, on the other cloth face a white figure appears on a blue ground. Double-cloth results in two thicknesses of woven cloth except where the two sets of warps exchange places. Two weavers, one on each side of the loom, must work in harmony to exchange threads and weave their own areas in turn. Figure 8. 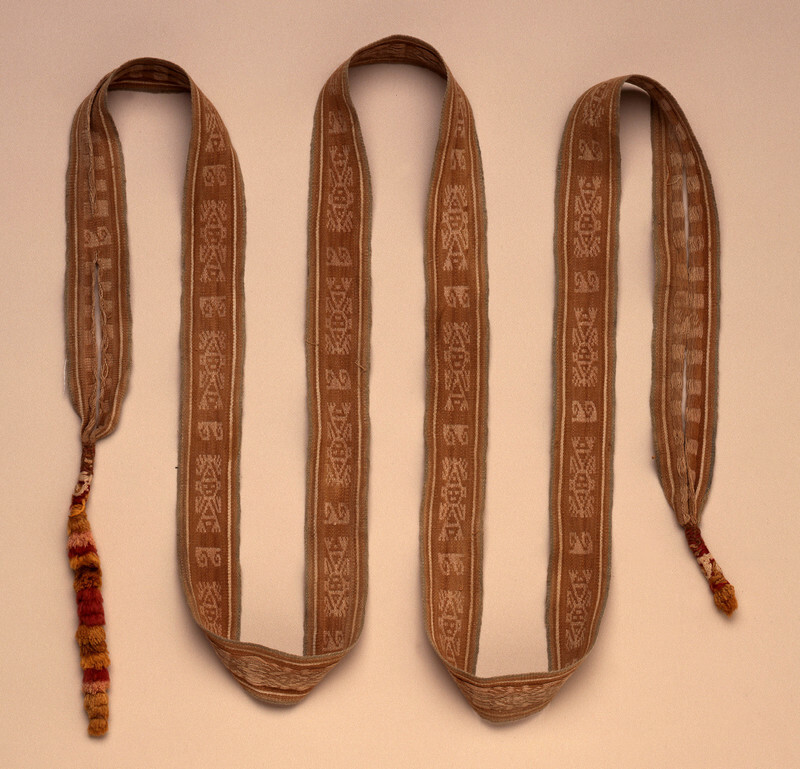 While almost all modern Andean belts and other textiles are made with complementary-moving warp threads, this rather unusal ancient belt is similar but made in a somewhat simpler, but analogous way. Michael C. Carlos Museum, 1992.15.288. Photo by Michael McKelvey. Technically named “complementary techniques,” color changes can be either warp- or weft-based, but more typically involve the warp. When placing the original warp threads on the loom, colors are alternated (for example, brown, white, brown, white) so that the weaver can later pick up with her fingernail or a pointed stick either whites or browns, pushing a second color to the other face of the emerging cloth. The motion of threads moving from the face near the weaver to the one away from her is thus the complementary, it is true ayni. What results is a design that is the same in terms of shape but opposite in terms of color. The wefts in this case travel back and forth to hold warps in their places; wefts drop into ukhu invisibility (see below) and are fewer in number than the warps, allowing the warps to dominate the surface. More detailed consideration of warp patterning, which became the dominant technique after the Spanish invasions and colonization, can be found in Capturing the Rainbow. Figure 9. A simple diagram of the effect known as “contour rivalry” demonstrates how two shapes, here hexagons, share a common side over which they compete for the viewer’s attention. Drawing by Georgia Clark. In terms of composition, complementary arrangement of motifs is common. The bird tapestry (fig. 3) shows how motifs can be turned around each other to embody k’eswa visually. Though it may be challenging perceptually, locate a white bird’s beak, then a brown one, and a viewer will begin to see the turning of one motif relative to its neighbor. Some pairs share their tail zigzags; an effect known as “contour rivalry” cements them together as the two gestalts fight over their common lines (fig. 9; Stone 1983; Stone 2014, 30, 67, 71, 84, 190, 193, 198; Stone 2012, 26, 48). This is also true of the image in figure 15, as will be discussed under Tinku. Extreme ayni is visually expressed by forms that cannot be separated; a purposeful artistic choice to make that perceptually impossible (fig. 9). 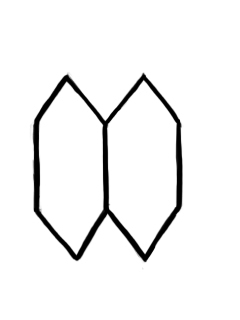 In this simple illustration, the central vertical belongs to both hexagons, which are in perceptual competition over it. By concentrating on the righthand one, the center line becomes its left side, and vice versa when focusing on the left-hand shapes. In the brown-and-white bird piece, some birds are in rivalry over their tails, while some are spaced barely apart and so become more visually separable. Concentration on the part of the viewer is required to follow the pairs and tease apart the very similar arrangements, so the overall ayni goal of inseparability is achieved. This artist’s choice to combine absolute visual ayni (shared tails) with moderate ayni (adjacent birds) points up individual Chancay weavers’ creativity within the compositional schema and subject matter typical of the style. Figure 10. 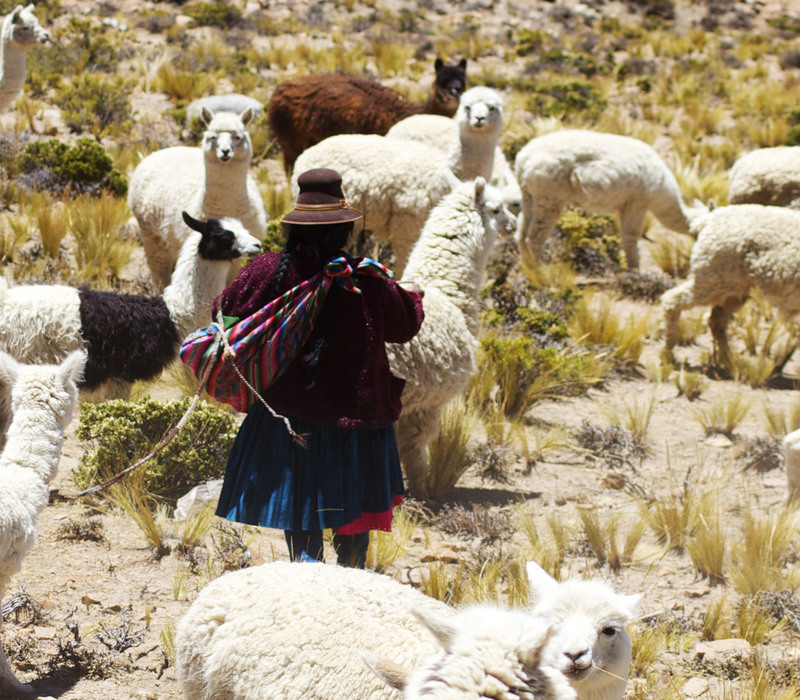 A contemporary Andean woman herder and her alpacas embody the interdependence of humans and camels that has always not only allowed human survival but also led to the enduring tradition of fine cloth in the Andes. Photo by Jono Goldsack licensed under CC BY-SA 2.0. Iconographically, the llama and herder doublecloth embodies reciprocity in many different ways. Alternating rows of llamas, of herders, and the two together comprise the composition. Undulating ropes join humans and camelids in the ultimate pairing necessary for survival in the challenging Andean environment, particularly at high altitude. Ropes also allow a herder to influence the lead animal of a herd. Camelids provide for almost all of people’s needs, from fur for warm clothing to dung for fuel, sinews for ties, and meat (though they were and are much more valuable alive than dead). Llamas in particular serve as pack animals, and caravans of them linked the people and products of far-flung regions in ancient times (see The Best of the Best). This composition emphasizes long lines of marching herders and their llamas, evoking the treks undertaken for millennia in the Andes. Since leads are not used on all animals in the herd, the rows with herders and llamas suggest that each is the lead pair of a separate herd, multiplying the vast members of the implied caravans. With traditional Andean wealth then as now counted in camelids, the wearer of this mantle was proclaimed very rich indeed. The human-llama ayni can also be understood via another subsidiary concept in Quechua; yanantín, or complementary opposites (Webb 2012, 1). In so many ways humans differ from camels: hair, number of legs, diet, social order, and lifespan. Yet humans and camelids together make the mountains and the high plains habitable. Sure-footed and hearty camelids also facilitate human reciprocity; they make trade and exchange possible despite natural environmental barriers. Opposites, it can be argued, more truly complement each other, filling in what the other lacks. Figure 11. 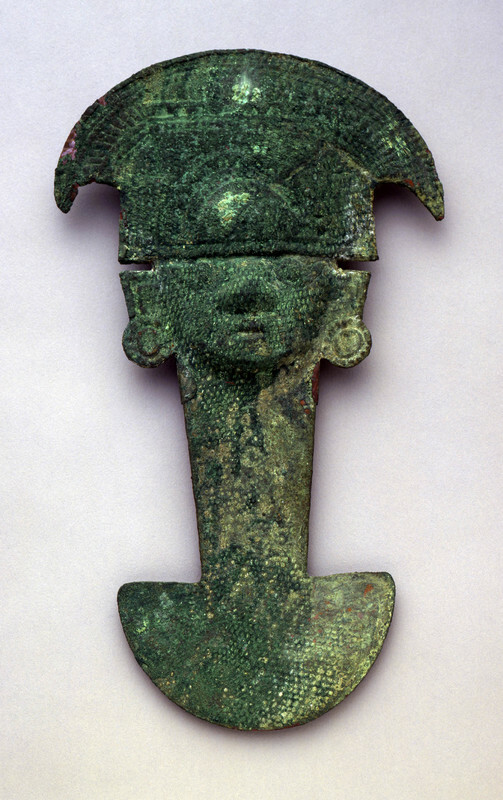 This large piece was obviously made in two pieces that are joined right down the figure’s body, representing ayni as a principle in construction. Michael C. Carlos Museum, 2002.8.1. Photo by Bruce M. White, 2013. Llama-human reciprocity is likewise echoed in the palette of contrasting colors of white and blue. A final nuancing of complementarity in Quechua are two words: samí is light, bright energy and hucha is heavy and dense energy. The white can be seen to embody samí and the blue hucha in this piece, as do the white and brown in the bird tapestry in figure 3. Finally, ancient Andean cloths were often constructed from two parts fig. 11). In the case of the tribute-demanding Late Intermediate Period Chimú Empire of the central and north coasts, panels of cloths sewn together into a single composition were accomplished piecemeal by various artists. Therefore the final products reify (make an idea concrete) the widespread tribute demands of the state in luxury goods. The Chimú capital city of Chan Chan housed an estimated 12,000 artists creating textiles, metalwork, and other prestige items (Day 1982). When the parts do not absolutely match up, as in the face of figure 11, the idea that multiple people contributed to it is visually foregrounded. Again, textile-literate populations perceive the messages inherent at all levels (materials, techniques, dye colors, subject matter, design, and garment construction). 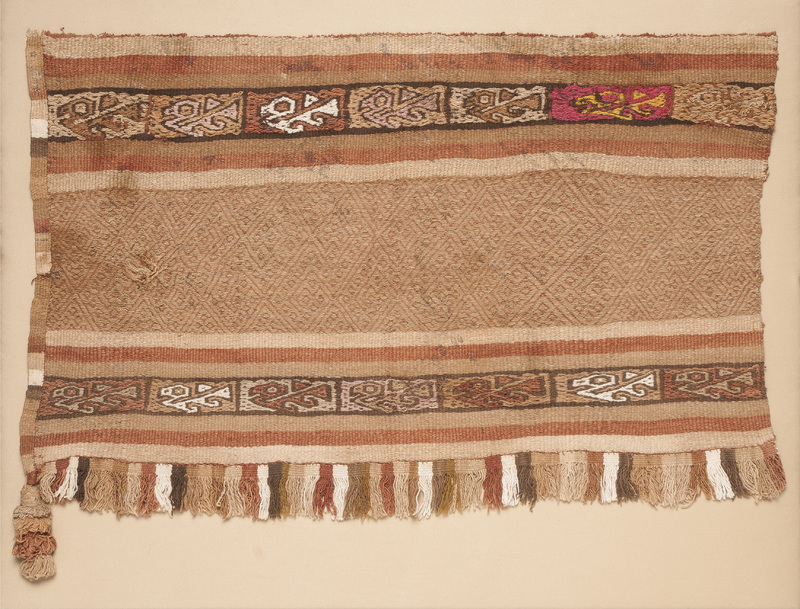 The deeply Andean message, “many contributed to this textile,” is shown in an unavoidably divided figure. Sometimes ayni is a principle so deeply embedded that a garment gives the impression it was made from two parts sewn together, while it actually was not constructed in that manner. A complete Chancay headcloth at the Carlos Museum (fig. 12) is a good example of this: the reinforced lines down the center create a “false” seam. Such reinforcement might have helped mitigate the sag in the grid of single (unplied) warps and wefts that was employed. Possibly the thicker area served as a “fold here” instruction (the headcloth was folded on a woman’s head, according to fiber sculptures [Stone 2012, 189]). Folding makes a single piece of cloth into a physically doubled one, another ayni. However, repeated folding breaks the fibers, hence a savvy wearer might have compensated for such a situation by adding extra threads. In any case, the appearance of two parts in a unitary piece remains, for whatever reason, embodying ayni. Figure 12. This complete woman’s headcloth from the Chancay culture seems to have been made of two parts (as in figure 11); however, in reality it was constructed in one piece. The reinforced central area may have helped the weavers to stabilize such a gossamer cloth, but it also fulfills the Andean mandate of ayni. Michael C. Carlos Museum, 1989.8.163. Photo by Michael McKelvey, 2017. The novelty of what is produced by encounters between different people and things allows for creative innovation. Change is, at base, that which is different. Adding the element of change to the balancing idea of ayni, is tinkuy (as a verb) or tinku (as a noun) which means generally to encounter, specifically when two things converge into a new third entity. 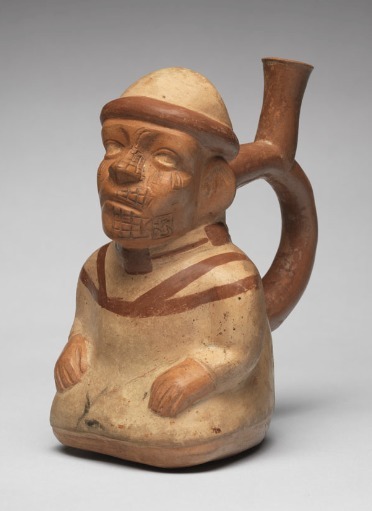 Jeffrey Quilter has given as an example of tinku the ubiquitous northern Peruvian ceramic form, the two-to-one spouted, or “stirrup spout,” vessel (fig. 25; Quilter 2010, 43). When two paths meet, and become a third, possibly going in a new direction, that is a tinku. 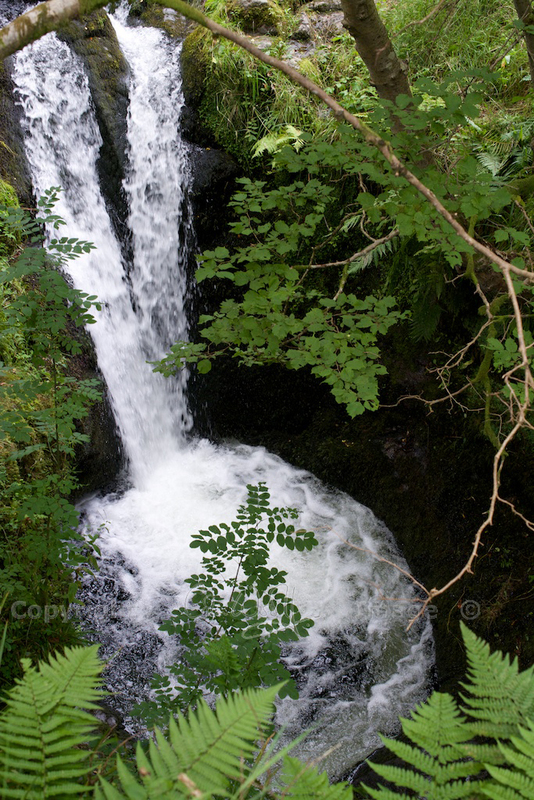 So is two waterfalls whose waters merge into one pool below (fig. 13) or two streams that converge to make a wider one. The Amazon River is perhaps the most extreme example, its headwaters two miles across where the Marañon and the Ucayali Rivers meet (though scientists now say that the Mantaro River further south in Perú is the original source [Contos 2014, 32]). In the Andean worldview there is an element of sacredness when two things come together to make a third. To create a tinku in the Cusco Valley to mark their capital as special, the Inka helped nature by canalizing two rivers so that they met in a third. Chavín de Huantar, the much earlier pilgrimage center in the north-central highlands, was likewise strategically placed where two streams met a third (Stone 2012, 37). A tinku arrangement of waterways and paths in nature not only facilitates travel, an absolute necessity for survival, but also allows for rendering tribute or bringing offerings on sacred pilgrimage. Figure 13. In Quechua, the concept of tinku is applied to such natural phenomena as two waterfalls that join in a pool below. Photo courtesy of Jo Woolf. Yet in ancient usage and in modern practice tinkuy also may have an element of conflict and the contradictory; despite this, the third entity that results is reconciliation, which is more productive than what existed before the tensions were expressed. Contemporary indigenous groups in Bolivia today stage an “us” versus “them” tinku event, a sort of stylized fight between adversaries that releases social tensions and clears the air (Allen 2002, 192-193). Again, the two participants need not be exact mirrors of each other, but nonetheless form an unexpected complement. Once more, survival in the environment is advanced by this concept which brings together parts that need completion. The vertical world of the Andes and its flanking desert and rainforest demands the trading of various foods for balanced nutrition. Traders transport fish, meat, beans, maize, and potatoes across environmental zones. The products of these areas are easily distinguished, nearly exclusive to one area and not another, so their tinku is obvious to all. Being fundamentally additive in nature, different things must come together for cloth to exist: two thin threads to make a strong thicker one, the warps and the wefts, and the cotton of the fields and the camelid fiber from the mountaintops. Furthermore, materials from far-flung ecosystems, not only cotton and camelid fiber but traded exotica from feathers to shells to metal, can form ever new combinations. Tinku can be seen as the fundamental definition of creativity — novel recombination — and ancient Andean textiles are nothing if not creative. The ultimate qumpi, featherwork, is a prime example of combining tropical feathers from the far-off rainforest, moving them over the Andes Mountains, and merging them with coastal cotton plain-weave cloth or plant fibers. These special compositions only survive because the final feathered cloth products were ultimately preserved in the dry areas. Such brilliant shining feathers were wholly foreign to the desert coast, and would have stood out dramatically against the monochromatic desert environment. Furthermore, feather garments transformed the wearer into a shining bird-human combination, expressing the spiritual connotations of visionary flight and shamanic transformation into one’s animal-self (Stone 2014, 45). The tinku they embody thus links the terrestrial and the celestial into a third composite entity, the transformational bird-shaman/leader. Each Quechua concept has a spiritual extension, since in the greater Andean worldview the terrestrial and the Other Side are intrinsically linked. Figure 14. 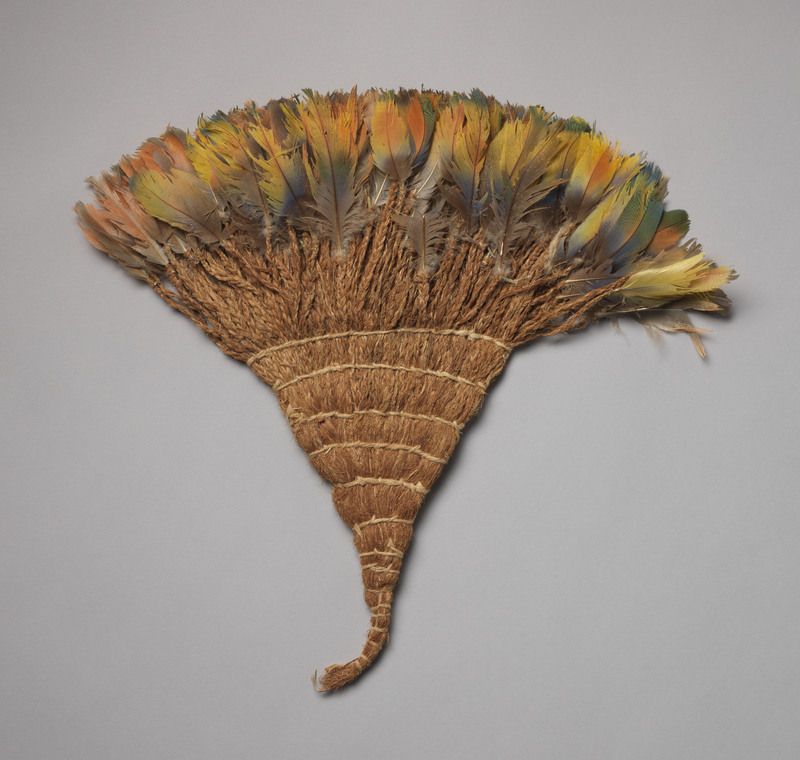 A Chimú fan brings together plant fibers and tropical bird feathers from across the Andes to the Amazonian rainforest, a type of material tinku or convergence. Michael C. Carlos Museum, 1992.21.1. Photo by Bruce M. White, 2016. In another expression of tinku, certain high-status woven garments often bring together many diverse parts through sewing, as well as various techniques executed on the same grid of warp and weft (fig. 15). Again, textile-literate viewers at the time would know if a plain-weave piece had brocade, plus tapestry borders, and tab fringe (essentially slit tapestry fringe), as in figure 11. This is a form of virtuosity, even artistic competition among the best weavers (understandable in a tradition in which textile achievement ranked high). Technical tinku compositions demonstrate who could master many techniques, unusual ones, those involving many steps, and lent to the wearer this same prestige. The fragments of a spectacular Pacatnamú-style tasseled shirt (fig.16) combine tapestry, unusual spiral-woven roundels, tassels, and an elaborate fringe. 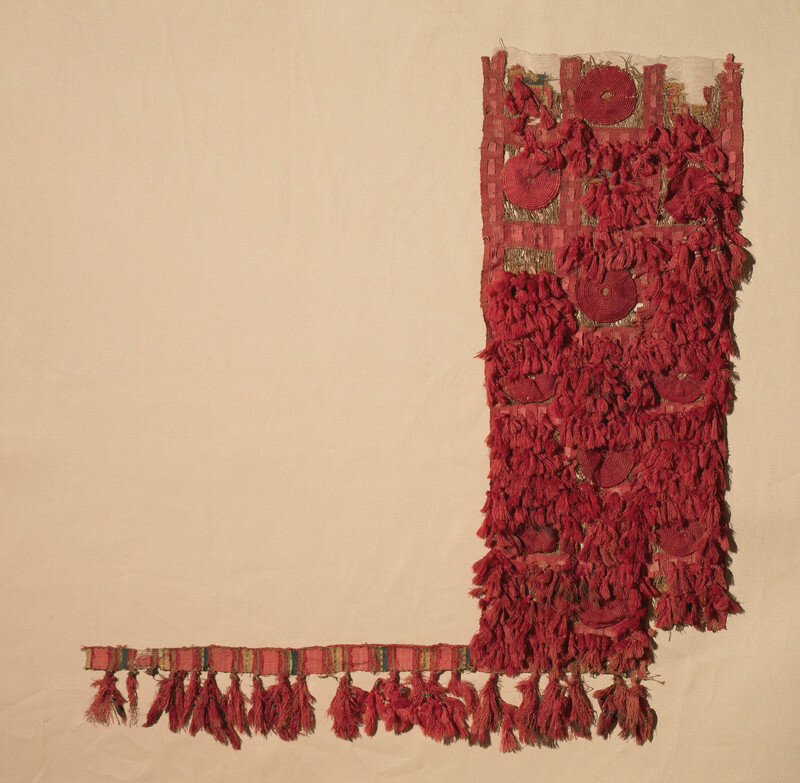 The tassels cover up most of the tapestry, a prime expression of ukhu (see below); however, this also shows how one high-status technique can be covered by others, constituting a sort of “conspicuous consumption” in the technical realm. In a flagrant gesture of supreme technical prowess that is typically Andean, the weaver did not even have to reveal to an audience all the methods of weaving that she had mastered. Figure 15. This piece, made up of three complete panels sewn together, expresses tinku, or convergence, on the physical and design levels. Michael C. Carlos Museum, 2003.40.16. Photo by Bruce M. White, 2016. Another remarkable feat in the history of fiber arts is the creation of the Wari discontinuous-warp- and -weft tie-dyes (fig. 17). Usually the weft is discontinuous (meaning the colors of thread change across the width of the cloth), as in tapestry, but to make the warp also discontinuous is a definite aberration in the textile arts. However, Andean weavers never seemed to shy away from any such limitations or technical determinism. 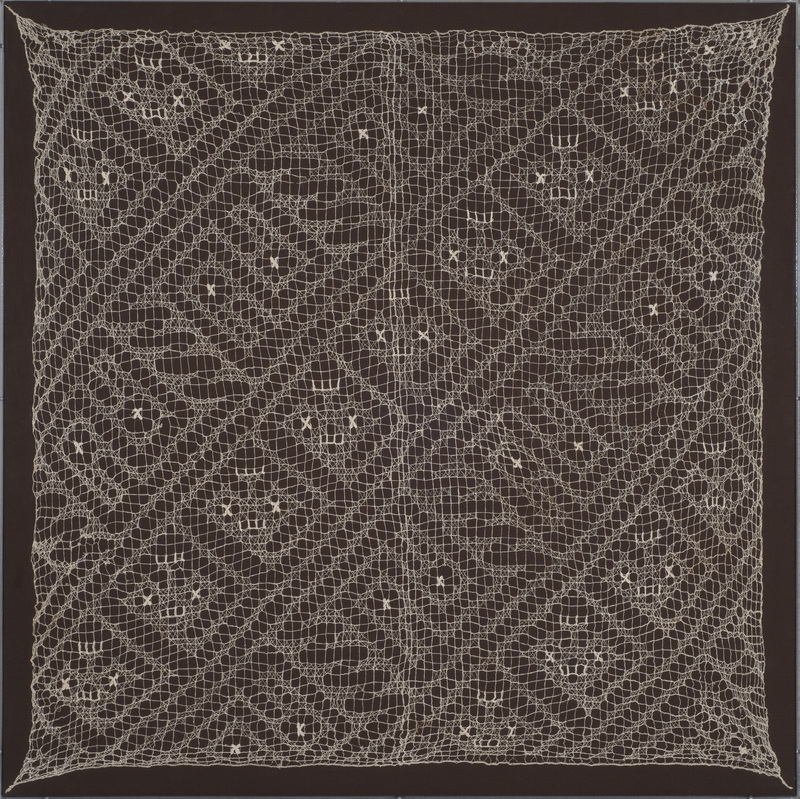 Each of the stepped triangles in figure 17 is its own shaped cloth, the sections of warps separated by scaffold threads across the loom (see Shelley Burian’s Carlos Museum blog about recreating a Wari textile). Then the wefts cross each stepped unit in plain-weave, and when the scaffolds are pulled out, the near-identical finished stepped-triangle-shaped cloths pop off the loom fully formed. Tie-dyed in various color combinations, the cloths are so precisely woven that they fit back together to make a wildly colorful final composition. Textile-literate viewers recognize that this effect could not have been accomplished in any other way than this ultimately laborious one since different tie-dye palettes necessitate separate dyebaths to achieve. Simply understanding tie-dye coloration — in which a cloth may go from white to yellow to red to purple in successive dyebaths, but not white to blue to yellow — means a viewer knows a white/purple/red cloth cannot be continuous with a yellow/green one. 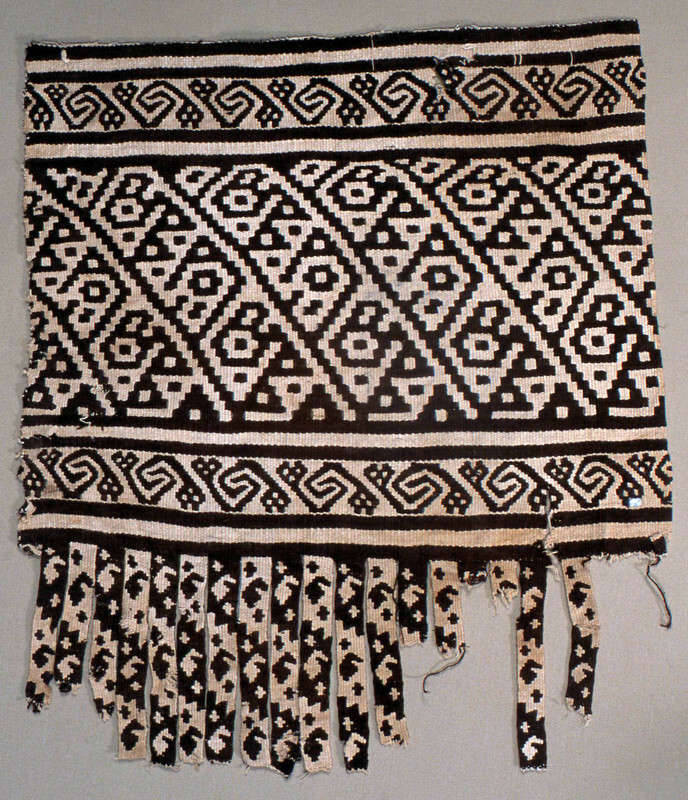 This discontinuous warp-and-weft technique was employed only once in world history, only in the ancient Andes by the Wari. Its labor intensity and its counter-intuitive process, are extraordinary by any measure. To reconstruct is to practice tinkuy, the near-impossible recombination of parts that started out separate but come together to make a unique, final artistic product. This extraordinary application of various techniques is certainly a prodigious example of tinku. Figure 16a. 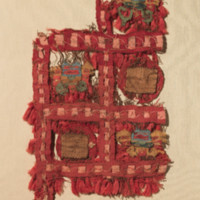 Bright scarlet tassels, woven roundels, tapestry, and other techniques are combined in this Lambayeque garment, expressing technical tinku. Michael C. Carlos Museum, 2004.64.1A (larger fragment). Photo by Bruce M. White, 2008. Textile designs also succinctly communicate the tinku concept. One piece in this exhibition features two birds that share one over-sized tail (figs. 18a-c). The quill (end) and rachis (shaft) of the feather is rendered in threads that were carefully tie-dyed before being woven, achieving the gradual shading present in a natural bird feather. The contour rivalry that was present in ayni is also possible with tinku; here, the entire feather is shared by each of the two blue birds on either end. Thus, there are two birds, but three visual parts, the third is visually uncomfortable since the two birds each claim it, depending if it is read as one bird’s tail or the other’s or, impossibly, both. The Quechua concepts, being so relational, are often intentionally difficult to resolve; parts are in search of resolution, which may never be attained. However, visual paradox is not only an Andean predilection but also interesting to viewers and therefore is found in many different times, cultures, and styles of art. It may be a hallmark of great art, in fact. Like Mona Lisa’s smile; literally for centuries different opinions can be brought to bear on ambiguous imagery. 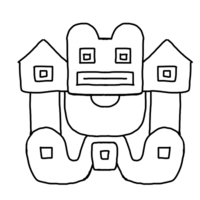 Andean art styles have a high tolerance for paradox, which comes more and more to the fore in exploring the concepts of ukhu and q’iwa. Figure 16b. Michael C. Carlos Museum, 2004.64.1B (smaller fragment). Photo by Bruce M. White, 2008. Figure 16c. Drawing by Georgia Clark. Ukhu is the Quechua concept that posits that the inside, even when not visible outwardly, is actively influential to the whole. Like ayni, this signals another type of dual balance, here between the unseen and the seen, between the understood or potential and the apparent or manifest. Ukhu is applied especially to the interior level of anything; for instance, the cosmic level that is inner, deeper, and lower or previous in time/space is known as Ukhu Pacha. By contrast, the outside is known in Quechua as hawn (Mannheim 2011, 6). Catherine Allen writes elegantly about the claim of modern indigenous Andeans that “the Inka have gone inside,” allying previous times and inner states of the present as one and the same (Allen 2002, 193). Her informants may have also meant that their ancestors are still effectual but act from an inner place, withdrawn back into the earth, or from inside their descendants. The phrase signals yet another dialectic, one in which descendants manifest their ancestors and ancestors influence their descendants. This is truly a layered universe, an energy-exchanging relationship that is characteristically Andean, as in the concept of camay discussed above. Allen also points out that changes in consciousness, especially movement from outward to inward awareness, is vitally important in Quechua language and culture. Furthermore, ukhu is anything deep or profound in the emotional and intellectual sense; self-referentially, ukhu is itself a deep and profound idea. Yet in order to recognize that something is hidden, that thing may also need to be slightly revealed. Something about the surface, such as the slightly puffy quality of a doublecloth (figs. 1, 27a-d), may suggest to a well-versed viewer the parts that truly cannot be seen and their characteristic reversal of colors. Again, familiarity with Andean cloth practices come to bear: knowing that almost all Andean textiles were created with finished back faces and insides means a viewer can reliably imagine the other sides that are withheld. 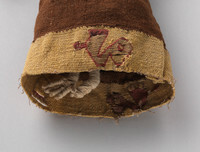 A Wari tunic may have hundreds and thousands of loose ends of its different colored wefts, but each one was meticulously sewn back in so that none were trailed across to the next area of that color; it was consummately finished on all sides although the inner face was not seen. In fact it is not possible to distinguish the front from the back face of Wari tapestry fragments. The value on the inner being right, just as right as the outer, is strong whether an audience can see it or not. Reality trumps illusion in the Andean textile tradition. Figure 17. Deceptively simple at first glance, Wari tie-dyed discontinuous warp and weft (patchwork) is tinku that involves numerous convoluted processes to achieve. Michael C. Carlos Museum, 2002.1.148. Photo by Bruce M. White, 2014. In further exploring the idea that ukhu is not simply hidden but also revealed, the edge of a garment, especially an open one like a mantle, can give a glimpse of the back face which is normally against the wearer and so visually inaccessible. Thread-wrapped reed toes of a fiber figural sculpture (fig. 19b) may intentionally peek out, revealing that there are finished legs under the skirt. This textile figure — resembling a doll but actually a portrait of her owner — especially participates in the perceived animation of fiber; cotton, camelid fiber, and reeds (a plant fiber) are formed into an entire, well-dressed miniature person. If textiles were considered as fundamentally alive as people, then a fiber version of a person certainly cannot be lacking or incomplete on the inside. It must encode the legs hidden under the skirt. The flesh person and the fiber person both have consciousness, integrity, and hold life force as a camasca (a visible manifestation) given it by a camac (an invisible force). Thus, the hidden/revealed dynamic is not only an idea or concept made material, but is a spiritual claim as well. Figures 18a. A long band (a) and a detail thereof (b), one motif of which is seen in c, exemplify tinku in that two birds share a third element, an oversized tail in the form of a feather. Michael C. Carlos Museum, 2006.24.1. Photo by Bruce M. White, 2013.
b. Drawing by Georgia Clark. In turn, ukhu reflects shamanic religion in that visions are invisible to all but the shaman, though they become revealed to the patient or the community through the interpretation the spiritual intermediary gives to that knowledge and its manifestation in a successful cure. The hidden cosmic realms, the land of spirits and ancestors, are the most powerful, constantly effecting the visible world and its occupants in the Andean worldview (“the Incas have gone inside”). That is why there is no real belief in death as the cessation of life, but rather the Andean/shamanic experience is one of constant circling and interacting of the Here and the Not Here, terrestrial life and otherworldly afterlife. Sumptuous textiles dress the living and the after-living (mummies) alike. 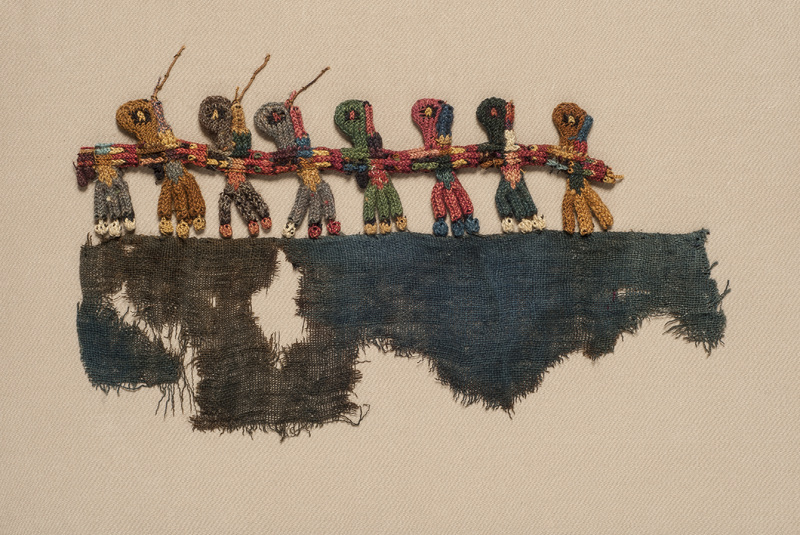 The fiber figure, which was included in its female owner’s grave participates in both phases of the larger life cycle, showing the ways that cloth bridges the worlds of Andean peoples past and present. Whereas in moist and/or northerly climates fiber rots away, but in dry caves, frozen mountaintops, and especially the preternaturally arid desert coast, cloth achieves extraordinary longevity. Thus a fiber version of a person can be analogous to a mummy, a lasting form of life. In the most basic application of ukhu, a wrapping cloth (fig. 20) variously covers, layers, hides, and then reveals that which is less visible under or inside it. Bundling textiles (and other things) inside a textile is an age-old practice in the Andes; this complex item is called a q’epi. The Carlos is lucky to hold an example that is at least 600 years old. Modern shamans use a large cloth to carry their sacred items, which they then set on top of the carrying cloth on the ground to form their mesa or “altar” for curing ceremonies in the Andes (e.g. Glass-Coffin 1998, 142). Strikingly similar practices still characterize modern Andean ritual life (see Capturing the Rainbow; Bolivian Incuña) as well as extend from the ancient to the modern Maya (see The Ties that Bind and Dressing the Saints; Maya sacred cloth). The practice of ukhu, in which a shaman bundles and then exposes power objects wrapped in a special cloth, emphasizes how the revelation of the hidden is central to indigenous Americans’ spiritual life (Rodas et al 1940, 131-134). Figures 19a. A Chancay fiber figure of a well-dressed woman features visible finery. Michael C. Carlos Museum, 2002.1.147. Photo by Bruce M. White, 2014. Figure 19b. The complete finishing of the legs and toes shows that normally invisible features are also significant and act as an embodiment of the concept of ukhu. Michael C. Carlos Museum, 2002.001.147. Photo by Bruce M. White, 2014. In terms of garments, the ancient body was both covered and shown in places. Lower legs and arms were usually bare, but copious overlay of dress/mantle/carrying cloth/headwrap for women and tunic/loincloth/mantle for men was the general rule. Similar layering still occurs, albeit with some Europeanized versions of garments, throughout the traditional modern Andes (see Capturing the Rainbow). Since a mantle may cover dresses, shirts, tunics, or loincloths, the dialectic of covering and revealing is not just of flesh but of other textiles as well. Textiles and bodies are so closely associated that they can play similar roles, constituting different kinds of skins and layers of protection, status, power, and abundance today. Warm, colorful, and elaborate clothing expresses that a woman has the skill and resources to create many layers for herself and for a man. Similar values have been in place for millennia, though in previous socio-political conditions groups of weavers, such as the Inka aclla, were also involved (see The Best of the Best). There has long been personal household-based cloth production and that of the state or empire. 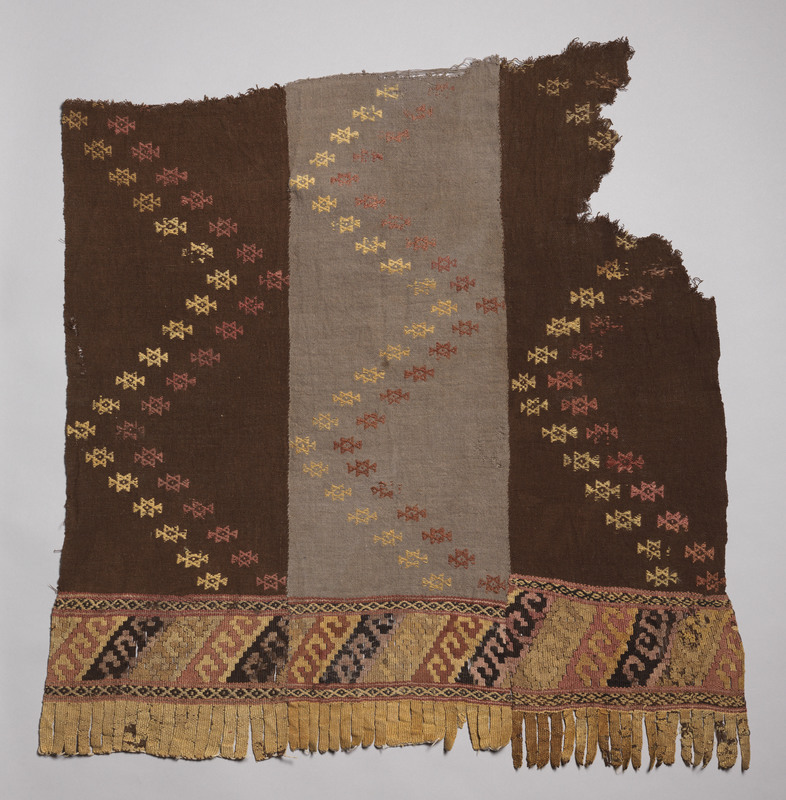 In the Andean tradition, layers may be created on purpose as parts of a single cloth as well. Although flatness is usually a prime quality of the medium of textiles, Andean weavers at various times defied this limitation. For instance, technically rather astonishing three-dimensional embroidery was invented and created for a few centuries by the south coastal Nasca ca. 200 CE (figs. 21a,b). The massing of thread over a thicker core thread allowed these hummingbirds to be projected into space beyond the boundaries of a mantle. The hidden core makes the visible figures possible, another instance of ukhu. 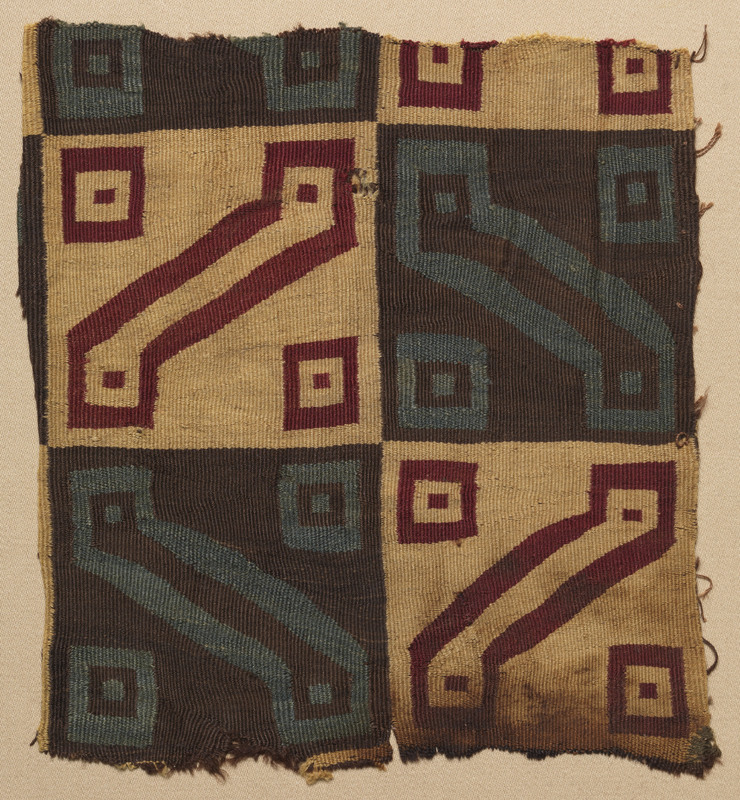 This so-called “cross-knit looping” (a misleading term because there is no knitting involved) illustrates the total lack of technical determinism – being forced into only certain solutions by the parameters of a given material and/or technique – in the Andean textile record. In an example from a thousand or so years later, only the loss of some of the tassels from the shirt in figure 16 make it possible to see any of the spiral-woven roundels and the openwork with colorful tapestry segments hidden below them. These are but a few examples of innovative, multi-layer compositions in which parts of the same textile cover other ones. Figure 20. Ukhu is aptly embodied in this rare q’epi, or cloth bundle, in which an outer wrap hides/reveals the eighteen miniature pieces within it. Michael C. Carlos Museum, 2003.32.1A (Outer Bundle Wrapping Cloth); 2003.32.1F (upper left); 2003.32.1Q (upper right); 2003.32.1B (lower right); 2003.32.1P (lower left). Photos by Bruce M. White, 2016. Figure 21a. These reunited fragments of an original early Nasca mantle feature three-dimensional embroidered borders depicting hummingbirds in flight. Michael C. Carlos Museum, 2002.1.3. Photo by Bruce M. White, 2014. Figure 21b. Nasher Museum of Art at Duke University, L2015.12.1. Photo by Michael McKelvey, 2017. Another textile mode that involves moments of hiddenness and others of revelation is tie-dye, discussed above (fig. 17). A key part of the process is, as the name implies, tying off portions of cloth so as to resist the penetration of dyes. The bits of cloth hidden under the ties are protected from later coloration, thus being hidden actually creates the color contrast and patterning for that the final product. Untying, which reveals the hidden portions and shows artistic success or failure (improperly or irregularly tying creates an inferior product, though tie-dye is rarely as accurate as woven techniques). The characteristic resulting circular and diamond-shaped patterning is easily recognizable as tie-dye. Ukhu is a vitally necessary stage in the creative process in this case. 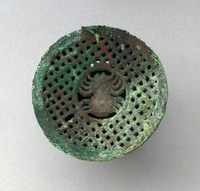 Finally, the significant and long-term Andean practice of layering of other objects in cloth comes to the fore in the “pseudomorphs” found on precious metal earspools and ceremonial knives and earspools (figs. 23-25). 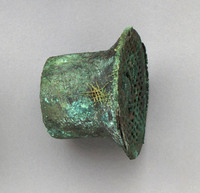 These pseudomorphs or “partial/new parts” are the result of the corrosion over time of the textiles that once enclosed the metalwork (see technical notes for the earspools, and Sicán and llama tumis). Converted into permanent elements thereof, pseudomorphs fortuitously record in perpetuity the actions of wrapping. Showing that such wrapping ceremonial objects was a widespread ritual act, these three examples include the Moche (figs. 23a, b, ca. 300 AD), the farther north Sicán (figs. 24a, b, ca. 800 AD), and the later Inka (fig. 25, ca. 1500 AD). In fact, one of the earliest archaeological configurations from the Andes is a stone scraper tool covered by a deer skin and tied with a plant fiber rope, dated to 4000 BC, from Guitarrero Cave (Lynch 1980, 239-241). Thus, taking a precious object and protecting it with an expanse of hide (the early version of cloth), and soon after cloth itself, is a very ancient practice in this part of the world. It functionally hides the other item from view and from harm, thus both protecting and valorizing it, making it special and important. By wrapping, cloth interacted with other significant media, according to the principle of ukhu. The act of unwrapping a special metal object would have been a dramatic revelation of that which was important enough to remain hidden often. Figure 23a. Michael C. Carlos Museum, 1992.15.274 A/B. Photo by Michael McKelvey. Figure 23b. Michael C. Carlos Museum, 1992.15.274 A/B. Photo by Michael McKelvey. Something slightly more unique that was and is of value to Andeans is the concept of necessary irregularity in life and in art, or q’iwa. In acknowledgement of the unpredictability of El Niño/La Niña events, earthquakes, droughts, floods, and frosts, Andeans are conditioned to accept surprise in their environment. Things that enliven by differing from the rest may be any of very diverse phenomena. They include the lifting protrusions left by the Inka on their fine polygonal stonework, casting beautifully irregular shadows (Hemming 2004); the odd weeping sound a llama makes when unevenly loaded; and things that are separated from their pairs, including the recently dead. The dead are seen as q’iwa because everyone dies alone and must traverse Ukhu Pacha before being properly reunited with their family (Stobart 1996, 68, 72). However, the dead are only alone for a brief time before becoming complete once more as a family or pair on the Other Side. Once again, this idea underscores the central role of duality in Quechua thought. Figures 24a. Michael C. Carlos Museum, 1994.18.33. Photo by Michael McKelvey. Figures 24b. Michael C. Carlos Museum, 1994.18.33. Photo by Michael McKelvey. In Andean textiles, brief moments of irregularity are also often embraced. To weave high-thread-count textiles is so deliberate and takes so much time that it is clear that when the artist varies a color area from the rest, it is a purposeful act. Off color and shape choices are not mistakes but rather form part of the design rules themselves. More prevalent from the Wari onward, deviating and anomalous colors and shapes were intentionally introduced into otherwise orderly weavings (Stone-Miller 1994, 41). Studying Wari tunic formal properties, I concluded in my dissertation that “one of the rules was to break the rules.” In my next project on the Museum of Fine Arts, Boston collection I found color deviations in Chimú and Inka textiles as well, though less often (e.g., Stone-Miller 1994, 131). In all the various examples, most of these q’iwas occurred using the color blue-to-green, the ones naturally produced by the indigo dye. I associated this pattern with the tricky, transformational character of indigo (see The Best of the Best); the unpredictable dye aptly played the unpredictable role in design. Recently I was told by a colleague in ethnomusicology that the perfect Quechua word for this predilection to break the formal rules is q’iwa (Henry Stobart, personal communication, 2012). The concept of q'iwa comes from music and specifically stands for playing a high, dissonant note on certain Andean flutes. In Western music, Hayden’s surprise symphony comes to mind as an extreme musical q‘iwa. Such notes surprise, draw attention, and potentially disrupt, but nonetheless are part of and lead into harmonious compositions. High pitched notes (like highly saturated colors) easily stand out from the rest of a composition, whether musical or artistic. A piercing sound such as a llama “weeping” is arguably like a light (samí) or bright color (Stobart 1996, 67-79). Certainly, musical compositions and color patterning are analogous modes, being non-verbal, relative, yet deeply communicative. The one bright pink background in the upper right of figure 26 draws immediate attention as different from the rest and is surely an anomaly (although this is not the entire textile to be sure). Thus, there is a range of the surprising irregular element in textiles, as in music. None of these alternatives are thought to be bad; as Annie McEwen concluded, “If anything, [q’iwas] call attention to the overall balance of a piece, reinforcing through a deliberate digression” (n.d., 13). The inherently deliberate nature of weaving again must be borne in mind to underscore the intentionality of q’iwa in Andean textile aesthetics. Revisiting other textiles already discussed in terms of the other Quechua concepts, there is one noticeable q’iwa in the headcloth: one missing X-shaped eye on one of the pelicans (fig. 12, lower left corner). The lack of something that is repeated throughout the rest of the composition comprises yet another type of irregularity. It may hint of a mistake, the embroiderer just forgetting to add it, yet the immense care and complexity of the rest suggests otherwise. Figure 25. Michael C. Carlos Museum, 1989.8.51. Photo by Michael McKelvey. 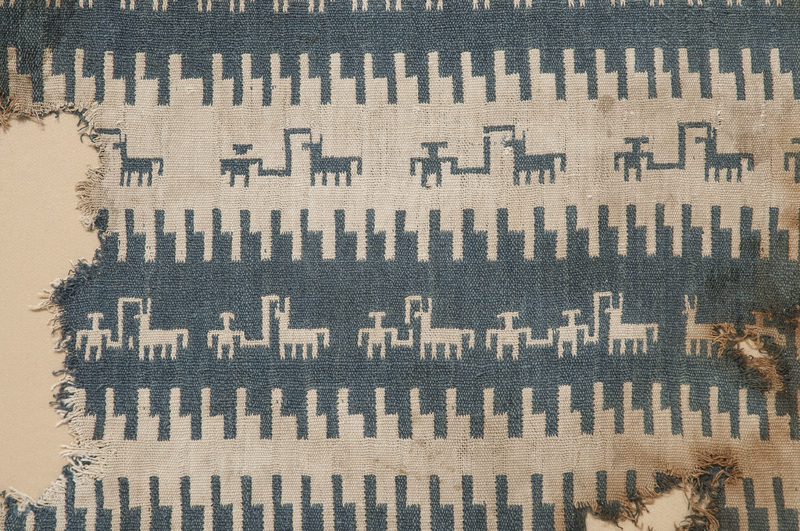 Despite its seemingly regular placement of llamas and llamas with herders, the blue and white doublecloth is rife with q’iwas (figures 1, 27a-d). Some of the irregularities in figure 28 include: a two-headed llama (b); sets of two herders instead of one whether herders both in front and behind the animal (c), only in front (d), but not connected to each other, or in front holding hands (e). Occasionally an extra line appears (such as between the llama head on the right and the leadline in b). Likewise, the leadline may be interrupted or broken (d). The fragmentary nature of the piece today does not preclude there having been many more q’iwas of different sorts. A viewer tends to find more and more subtle differences in the overall busy composition. By the same token, these q’iwas are not hidden, as is also true in later Andean textiles as a whole; they do not occur toward the sides of compositions, for example. As here, deviations may take place in the realm of shape, not color, showing that any element or aspect of a textile may purposefully incorporate surprise. It may be germane in this textile that llamas easily traverse wildly differing and decidedly irregular terrain on their long mountain treks. Figure 26. One bright pink area among the brown palette shows how q’iwa “surprise” may lend obvious irregularity to a composition. Michael C. Carlos Museum, 2003.40.14. Photo by Michael McKelvey, 2017. 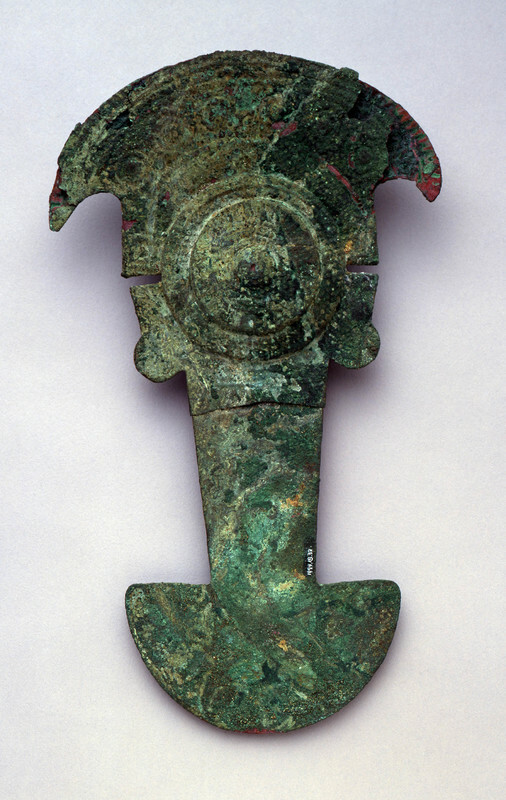 Outsiders from the Spanish onwards have also noted the sacred quality of the q’iwa person or thing. "Por los cronistas sabemos que toda cosa rara o extraordinaria era considerada sagrada por los antiguos peruanos, sagradas eran las montanas, y mas cuanto mas altas, sagrado tambien todo lo inusitado: los ninos gemelos, las plantas de formas poco comunes, las piedras de forma que recordara otra cosa, etc" (de Lavalle 1990, 62-64). Figure 27a. Numerous shape deviations characterize the llama and herder doublecloth. Michael C. Carlos Museum, 2002.1.37A/K. Photo by Michael McKelvey, 2017. Friar Bernabé Cobo, attempting to “extirpate idolatry” (snuff out native shamanistic religion), commented on this same idea amongst the Inka: “It was said that priests were not selected by chance nor without some mystery that marked them…[such as] born as twins or triplets from the same womb, [or]…given by nature something out of the ordinary” (1990, 159). It is fair to say that natural phenomena, humans, and the material realm were all subject to the important recognition that to incorporate that which was different was beneficial to the whole. Purely on the visual level, q’iwas in textile compositions add a dynamic liveliness that once again underscores how in the Andean worldview fiber arts were as alive as any other worldly phenomena. Figure 27b. 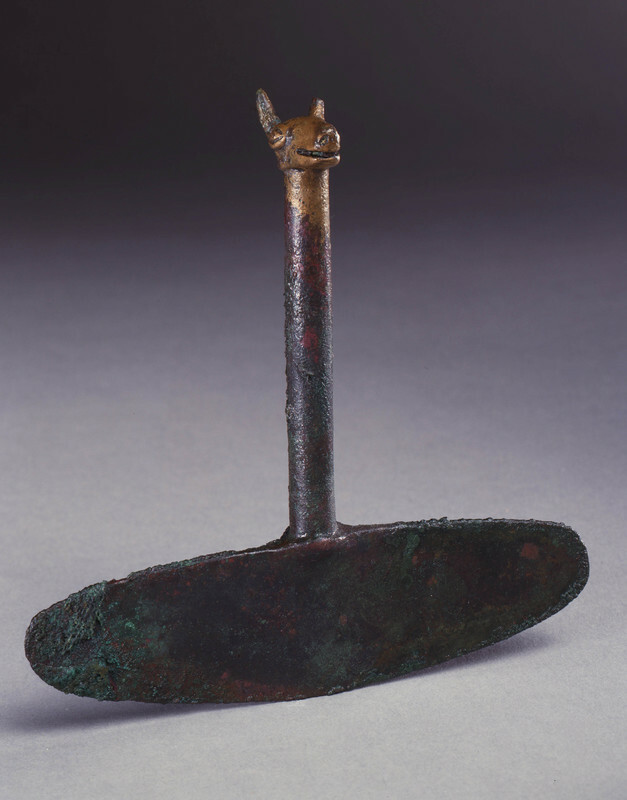 A q'iwa in the form of a two-headed llama. Michael C. Carlos Museum, 2002.1.37A/K. Photo by Michael McKelvey, 2017. Barbara Babcock has written cogently about the principle of symbolic inversion, reversal, negative, and paradox, linked to the human capacity for metaphor, that is, knowingly saying that something is what it is not (1978). It seems quite applicable to the Andean concept of q’iwa to speak of “framed disorder in the form of the ‘aesthetic negative’ is ‘variability training,’ ‘rehearsal for those real situations in which it is vital for our survival to endure cognitive tensions’” (ibid., 20). This rings true for the Andes, in which the “cognitive tensions” of frosts, droughts, floods, earthquakes, El Niño/La Niña events are omnipresent (Burger 1992, 14-15). The preoccupation in the arts for orderliness in direct relation to its opposite relates to this overall human tendency, as well as to the flexible Andean worldview and aesthetic system. Finally, it would be less than sensitive to Andean thoughtways to act as though the various Quechua concepts introduced here were separate, as if they did not interact, overlap, and ultimately complete one another. The herder and llama doublecloth (figs. 1, 27a-d) is replete with q’iwas within the overarching ayni but also illustrates ukhu, the inevitable hiddenness of threads as they pass from one face of doublecloth to the other. The two faces of the cloth, with their equal shapes but opposite colors, are each hidden from the viewer at a given time, but the knowledge of their complementary look and its revelation when turning the cloth over or glimpsing it in movement on a human wearer, constitutes another element of ukhu. Thus, these various factors work together to make various, dynamically balanced compositions. Figure 27c. A q'iwa in the form of extra herders. Michael C. Carlos Museum, 2002.1.37A/K. Photo by Michael McKelvey, 2017. Figure 27d. A q'iwa in the form of extra herders. Michael C. Carlos Museum, 2002.1.37A/K. Photo by Michael McKelvey, 2017. “Balance is achieved through the four elements of nature: water, fire, wind, and earth. However, in our language of Quechua there is a fifth element: ushay. Ushay is the state of perfect harmony between the four elements. It does not have an equivalent in Spanish. All of us can have ushay – the tree, the stone ourselves, the other animals – we are all part of this whole… We do not see a person as like a machine made up of separate parts, but as a complementary whole” (Michael McQuaide, personal communication, 2002). Ushay is a universal property that all people, animals, things, and artworks seek to achieve. It has no one appearance; it may govern symmetrical four-part designs (fig. 6) or compositions arrayed along diagonals (fig. 12). In fact, Ushay might help explain the “false” center seam which bestows two-part balance to a perceptually continuous, conceptually endless series of diagonals. Figure 28. A Moche effigy of a meditating shaman, whose eyes are shown completely white with cataracts, shows the widespread importance placed on individuals with unusual physical conditions, who can be thought of as embodying q’iwa or necessary difference. Michael C. Carlos Museum, 1989.8.71. Photo by Bruce M. White, 2011. The centrally balanced composition is a manifestation of the overall cyclical thinking that characterizes First Nations and differs substantially from the linear thinking prevalent in modern Western cultures. Repetition, complementarity, and wholistic entities are more valued than mono-dimensional and –directional ones. The balance of the group takes precedence over the individual, both socially and artistically. Indeed, it is rare to have one figure on an Andean textile; though it may appear to be a single being, the Pelican Shaman (fig. 11) is covered in other birds and was once part of a four-part or larger composition, whose parts have been spread to other collections (see T.M. 91.286 at The Textile Museum, Washington DC and 1953.288 at The Cleveland Museum of Art). Balance can be achieved between multiples and is more complex than in a singular image. Hopefully some of the complex and fascinating Quechua concepts that so naturally underlie ancient Andean textile arts from materials and techniques to design and subject matter have been introduced here. These concepts can also be gleaned, perhaps due to some universality they possess, in the other cultures represented in the Threads of Time exhibition. Other essays will touch on the differences and similarities to be found in the traditional-yet-changing modern Andes (Capturing the Rainbow), among the modern Guna of Guna Yala off Panamá (Engaging the New), and the ancient and modern Maya (Creations of the Red Goddess, Dressing the Saints, and The Ties that Bind).